Buttermilk Biscuits smothered in sausage gravy is not commonly found on restaurant menus in Canada. I'm not sure why that is. This dish is very common through out the US. If I had a restaurant that served breakfast this would definitely be on my menu. 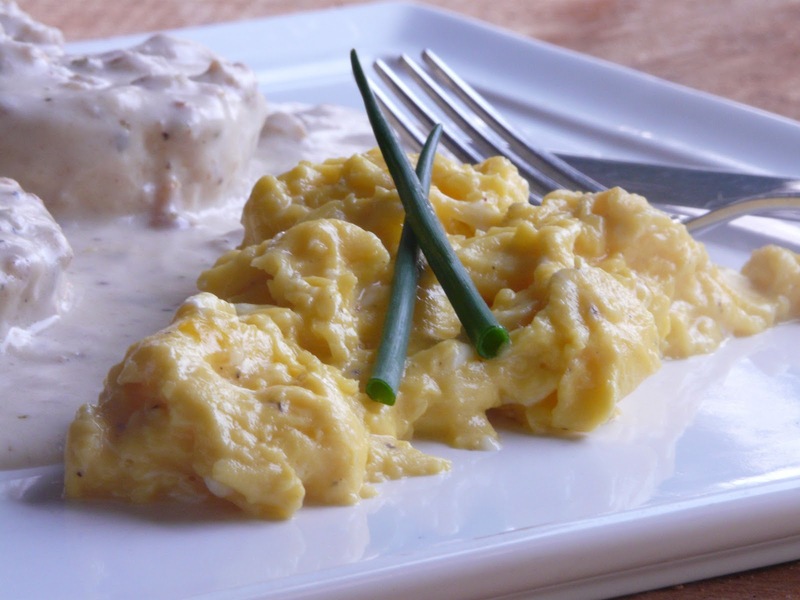 Good way to use up leftover biscuits. This is just a basic outline. If using links remove sausage from casings. Saute sausage in butter or oil. Break the sausage up into smaller pieces. When Sausage is brown add minced garlic. Cook for one minute. Add one to two tablespoons of flour. Cook for 3 or 4 minutes. Add cream and/or milk. (Or combination of cream and chicken broth) Season with salt, lots of fresh ground pepper and minced sage. Simmer for 20 minutes or so to meld the flavours. Serve over homemade buttermilk biscuits. 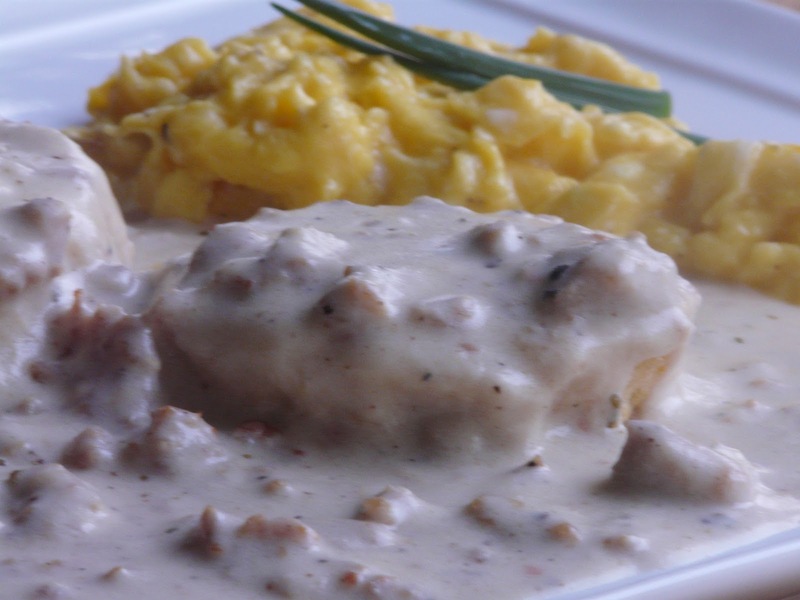 Note: If you have any leftover chicken, turkey or pork gravy add it to the sausage gravy. That is what we call 'down home' cooking. We do it, but no garlic or sage. With dish like this you must live in the South (of Canada). The biscuits looked good yesterday, but they look awesome today. You make your gravy just as I do. I haven't had breakfast yet, and I'm instantly hungry. This is making my mouth water, and it's always a good breakfast when you fix it. Now I'm envious. My parents bring canned sausage gravy out to us in the midwest since it is not huge out here either, and I just had a bit of it with a piece of toast for breakfast. I actually jazz the canned stuff up with sage and pepper to give it a little fresher flavor, and it does cure the craving, for at least a little while! 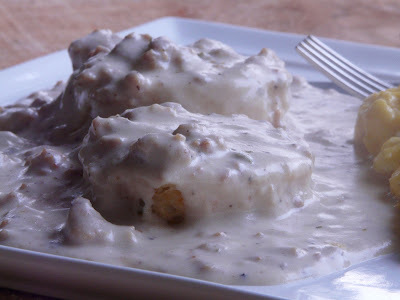 I can't even imagine how great homemade sausage gravy would taste this morning! I'm going to have to give it a try sometime, it looks perfect (and you incorporated the secret ingredients, LOTS of pepper and sage!). Delicious! 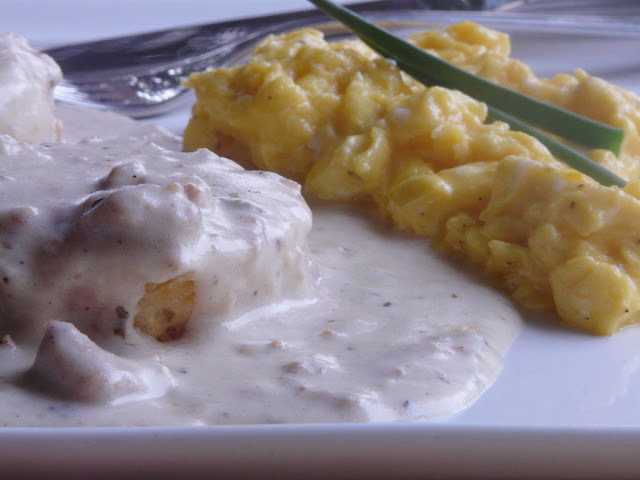 My husband introduced me to biscuits and gravy. How I ever got through life not tasting it, I don't know....my dad would have loved it! OH MY GOSH...these biscuits and gravy look so delicious. I was introduced to biscuits and gravy when I moved from the Columbia Valley in British Columbia to Kansas years ago and I fell in love with the dish. I make mine similar to yours but I'm going to try fresh sage this time now that we moved to the farm and I have a garden. Well it will be growing season soon ;) I also wanted to tell you that you take the most wonderful photo's of your food! I think I would even be willing to try something I've steered clear of my whole life because your photo's make it look so good! I have sent your Blog link to my daughters...one in Vernon and the other in Ft St John...they both love to cook AND take photo's so I know they'll enjoy it. Anyway THANK YOU for creating such a wonderful Blog and for being so generous to share it with all of us. I hope your day is a good one.